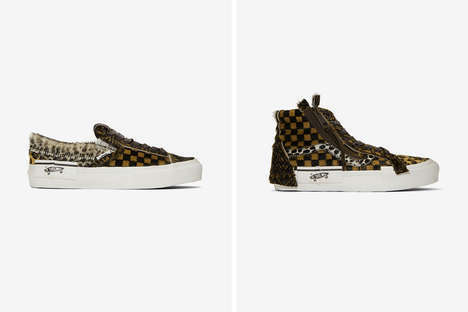 Vans Cauly introduces a new pack of sneakers that take on some classic footwear models as a foundation, elevating the design with deconstructed pony hair materials across the uppers. The latest pack highlights the ‘Cap LX’ and the ‘Sk8-Hi’ — the Cap LX sneaker is a hybrid design that blends a low top lace-up sneaker with a slip-on. It is accented with a branding patchwork that reads “Off the Wall’ at the side instead of the usual heel placement. The Sk8-Hi sneakers feature the same misplaced branding patch in addition to some overlapping panels throughout the sole area. The new series spotlight a color palette that fuses brown and black check tones. There is also a plethora of patchwork made up of cheetah, zebra, and check pony hair panels.